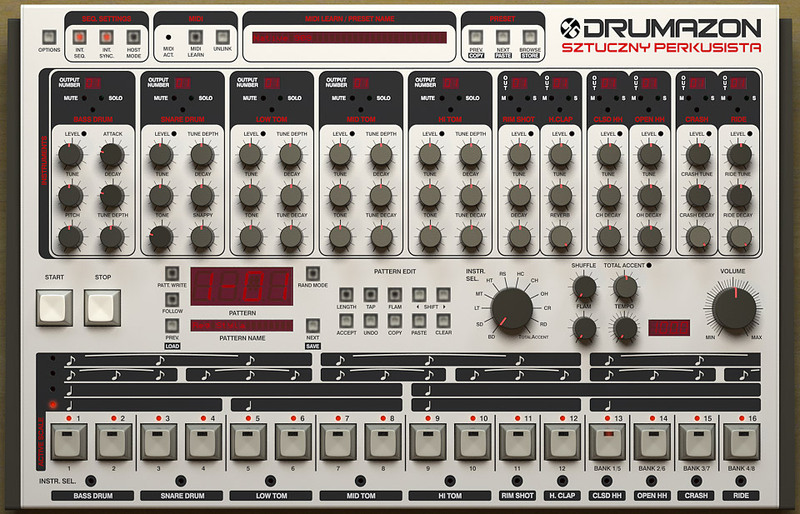 Drumazon is an emulation of the classic Roland TR-909 drum machine / beatbox, offering all the original functions plus many additional features. Perfectly scaled knob ranges with few modifications enlarging spectrum of the sounds. Enhanced control of instruments' sound. User defined plugin output settings. MIDI map equivalent with the classic drum machine's map. Each step can be defined normal or flamed and accented or not. Shuffle, Flam and TotalAccent values defined globally and per pattern. Individual presets per instrument with preset manager to easy control.